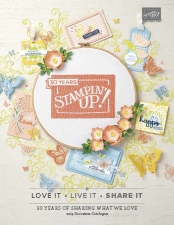 Thanks for joining me and 25 fellow demonstrators for ESAD’s 2017/2018 Annual Catalogue Sneak Peek Blog Hop. You may have hopped over to me after seeing Kim’s fabulous project. When you’re finished on my page make sure you click on the next button and hop over to Sandra’s project. You won’t want to miss out on any of these amazing creations. Today we are giving you a Sneak Peek of some of the new products from the 2017/2018 annual catalogue. Ordering from our new catalogue starts on the 1st June. If you’d like a copy of the new catalogue please contact me through my website. Anyone that knows me knows I love earthy colours and texture so when I saw the Wood Textures Designer Series Paper Stack I knew it would become a favourite. This DSP is perfect to use with the Wood Crate Framelits but I thought it would also look great on cards. I’ve paired it with the new Lovely Words Thinlits and the Stitched Shapes Framelits. I’ve made the DSP the hero of the card. I just love the texture of this piece. I also added some to the inside. I couldn’t stop there because the other side of this piece of DSP is just as amazing. How gorgeous is this new In Colour, Lemon Lime Twist? Or do you prefer Berry Burst? I love how the Stitched Shapes Framelits co-ordinate so well with the Lovely Word Thinlits. My assistant Marvi didn’t really have a favourite card as none of them had any Twine or Ribbon on them that he could pull off. I think he was more interested in the camera today. Now it’s time to hop over to Sandra’s blog and check out her beautiful project. Just click on the next button. Thanks for stopping by, I’d love if you left me a comment. Here’s my design for the Colour INKspiration Challenge C109. This time the challenge requires you to use Cherry Cobbler, Dapper Denim and Pool Party. We can also use any neutral colours and metallics. I haven’t made a card for this challenge, I’ve made a small crate with note cards. I’ve used Serene Scenery DSP for my Wooden Crate. The Pool Party wood grain pattern is perfect for the challenge. I’ve made 3 little note cards to go in my wood crate and added some envelopes as well. I’ve used a clear block stamped in Pool Party to create the background behind the daisy. I think the small daisies stamped on the envelopes look super cute. I hope you like my project. I’d love you to leave me a comment. I’ve changed the card to Pool Party card stock. I’ve also changed the embellishments on the banner, using Flourish Thinlits in Silver Foil behind the sentiment. 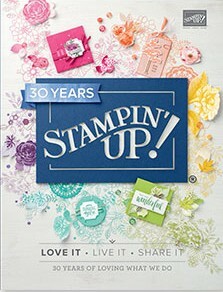 I love the border stamped on the sentiment, it matches the stamping on the card.